A pimple-targeting foaming wash containing sea minerals and salicylic acid. The weightless, airy foam deeply cleanses pores and helps prevent pimples by removing excess sebum, dirt and impurities. Spawake Pimple Solution Refreshing Face Wash is non-comedogenic and leaves skin clean and shine-free with an invigorating fresh feeling. The menthol gives a cooling effect on the itchy skin. About the Brand: The name 'Spawake' denotes the awakening of natural skin beauty with Sea Spa, a beauty treatment enriched with the goodness of sea. Spawake offers the most sensuous range of skincare products, from the heart of beauty -The Sea. Developed from the sea-sourced natural Seaweeds and active ingredients under advanced Japanese technologies, these offer effective and replenishing skincare solutions. Explore the entire range of Facewash available on Nykaa. Shop more Spawake products here.Alternatively, you can also find many more products from the Spawake Pimple Solution Refreshing Face Wash range. Explore the entire range of Face Wash available on Nykaa. 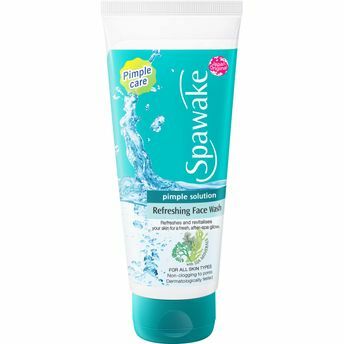 Shop more Spawake products here.You can browse through the complete world of Spawake Face Wash .Alternatively, you can also find many more products from the Spawake Pimple Solution Refreshing Face Wash range.